Marco Di Lauro was born in Milan in 1970 and he lives in Rome since 2000. He takes his first photograph at the age of 14, during a vacation in Egypt. His mother teaches him how to use the Olympus OM10 and frame his first landscapes. The attraction he feels for beauty as the truest expression of every form of life (and its reason for being) leads him to dream of a future as an art critic and to study Italian literature and art history at the State University of Milan and to the United States, where he enrolls in a course in journalism at Boston University in Massachusetts. 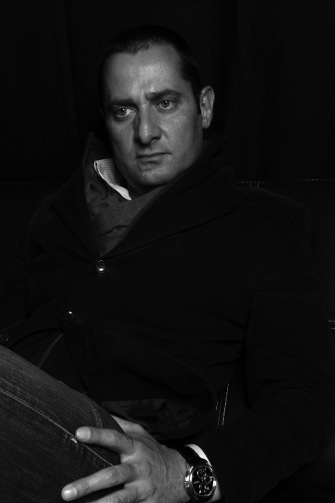 In 1995, he returns to Italy and obtains a diploma in photography from the European Institute of Design in Milan. His decision to be on the scene at the most explosive armed conflicts of the 21st century is arrived at gradually. Between 1990 and 1994, Marco Di Lauro prefers using his Nikon to document the social issue of abused and abandoned children in India or the poverty of the inhabitants of Peru’s Andes mountains. At the same time covers fashion shows in Milan and Paris as assistant photographer and working as a photo assistant-editor at Magnum photos in Paris. In July of 1998, he pays his own way to the Kosovo, where he is one of the few photo-reporters on hand when the ethnic cleansing begins, just months after his arrival. His pictures from the front, selected every day from among thousands and printed every evening in a makeshift darkroom, meet with the approval of the Associated Press (AP). After the Kosovo, Di Lauro becomes a member of the AP staff and covers the 2000 Jubilee of the Catholic Church from Rome. He moves to the city, serving as photo editor for the Rome office. In July of 2001, he covers the G8 summit in Genoa, and in October of the same year, two weeks after the attack on Manhattan’s Twin Towers, he decides to leave on his own for Afghanistan, entering the country on foot from the north, over mountains that reach five thousand meters in altitude. For the second time in three years, he finds himself in the right place at the right time: he is one of the first Westerners able to cover the fall of Kabul from the inside, under the fire of the troops of the Northern Alliance, who take over the city on 13 November 2001. On that same day, a Taliban guerrilla fighter shoots at Di Lauro from behind during an ambush. In September of 2002, Marco Di Lauro begins working under an exclusive contract for Getty Images News Service, covering the Middle Eastern conflict in the Gaza Strip and then he spends almost all of 2003 and 2004 in Iraq, documenting the American invasion and the drama of the Iraqi people. In all the stories he photographs, whether large or small, in Italy, Peru, India, Kosovo, Afghanistan, Gaza, Egypt, Kenya, Palestine, Israel, Iraq, Lebanon, Uganda, Chad, Sudan, Jordan, Bosnia, Spain and West Bank, Marco Di Lauro always attempts to capture the sacred side of life and its deeper meaning. Along with his wartime coverage, Marco Di Lauro is on hand for more traditional, though no less hard-fought, clashes, such as the Palio of Siena horserace and the battle of the oranges that breaks out every year in the city of Ivrea in Italy at Carnival time. He also covers religious events, such as the Easter processions in Sicily, the procession of the snake-handlers in the Town of Cocullo and the Easter Processions in Seville or the religious life in Italy and the Vatican City. In 2007 Marco Di Lauro moved from Getty Images News Service to Getty Images Reportage for which he has been doing magazine assignment ever since. And In October 2016 he joined Verbatim Photo Agency, the new subsidiary and venture dedicated to commercial assignment launched by Getty Images. International News, Conflicts, Religion and Social Issues Reportage, Photojournalism, commercial, corporate and advertisment assignment. Newsweek, Time Magazine, New York Times Magazine, Los Angeles Times,Chicago Tribune, Miami Herald, Washington Post, Fortune, U.S. News and World Report, USA Today, GQ, Vanity Fair, Outside Magazine, New Yorker, Bloomberg Business Week, Irish times, The Times, The Guardian, The Independent, The Daily Mail, Sunday Times, Telegraph, Live Magazine, Sunday Times Magazine, Der Spiegel, Stern, Die Zeit, Paris Match, Le Monde, Nouvel Observateur, Lexpress, Liberation, Internazionale, Corriere della Sera, Repubblica, Panorama, L’espresso, Elmundo, El Pais and he has been working regularly for organizations like the United Nations High Commissioner for Refugees, UNICEF, Save the Children, AMREF and the CNN.